Prices are unlikely to rise and interest rates are under control. It makes sense to buy a house in 2019. The real estate sector has been going through a tough phase over the past five-six years. The year 2018 was a relatively better year compared to 2017. With big ticket reforms - Good and Services Tax (GST) and RERA (Real Estate Regulation and Development Act) - developers focused on completion of existing projects, there were fewer new launches (barring in the affordable segment) and the government encouraged (gave interest subsidy) for affordable housing. Though this pushed up sales numbers, the sector is yet to see any green shoots of recovery. Another important development was amendment of the Insolvency and Bankruptcy Code to provide home buyers the status of financial creditors. This will make them part of the committee of creditors and they will have a say in case of liquidation proceedings against developers. This will work as another layer of protection for home buyers. The sector is recovering from the aftershocks of demonetisation. There has been a mild uptrend sales in the last eight quarters. "The impact of the reforms has started settling in. Many believe the sector is entering a consolidation phase," says J.C. Sharma, Vice Chairman and Managing Director, SOBHA Ltd. In 2018, the first three quarters saw a 10 per cent rise in sales compared to 2017 as per the data provided by Liases Foras, a real estate research company. The cities are Ahemdabad, Bengaluru, Chennai, Hyderabad, kolkata, MMR, NCR and Pune. "Many developers have reported growth in sales in 2018. Primarily, it was because of extremely low numbers in 2017, as the base was low. 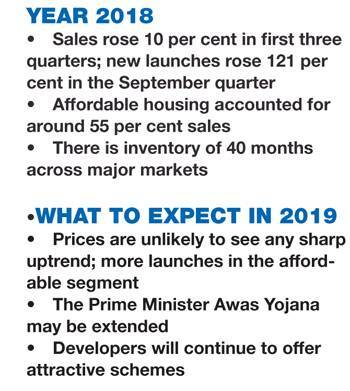 In addition, there have been good sales in past three months (July to September 2018) as well," says Maneesh Gupta, Senior Director, Valuation & Advisory Services at Colliers International India. Real estate portals are also witnessing increasing traction. "The year 2018 has been markedly better in the last two-three years. For us, the number of property transactions have gone up 55 per cent in the January-September period," says Tanuj Shori, Co-founder and CEO, Square Yards. The October-December quarter is important for the sector as many people plan home buying during this period. However, the recent liquidity crisis faced by non-banking finance companies (NBFC) after IL&FS defaulted on its interest payment could have impacted last quarter sales. The numbers for the last quarter are not out yet. "The credit crunch in the economy or rise in interest rates will impact demand growth and, hence, sales across the real estate sector," says Dhaval Shah, Joint Managing Director, Parinee Group. Since last year, there hasn't been any major rise in prices. In fact, prices have declined in some cities, as per Liases Foras. The weighted average price for quarter ended September was `6,770 square foot, almost the same as in the year-ago quarter. Despite the recent pick-up in sales, there was 48 months inventory in the Delhi-NCR market at September-end. This will ensure that the prices are unlikely to rise in near future. "I think the next year may take a slow upward turn but for home buyers to be back in action and sales to be steady will take another two years," says Shah of Parinee Group. In line with 2017, the affordable segment saw the most traction. Both in 2017 and 2018, less than 50 lakh houses accounted for around 55 per cent of overall sales, as per Liases Foras. Also, most of the launches have been in this segment. The increased affordability as prices remained stable or corrected a bit and interest subsidy under the Pradhan Mantri Awas Yojana boosted sales in this segment. 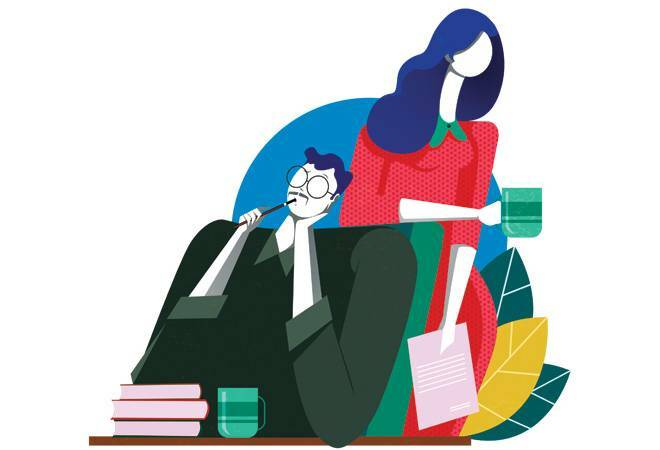 With prices almost stable, interest rates at a reasonably low level and RERA in place, it makes sense for those who are sitting on the fence should take the plunge. "In our opinion, this is a great time to buy a house for own use. Huge inventory means more choices and better prices," says Saurabh Garg, CBO and co-founder, NoBroker.com. It is advisable to do the due diligence before buying the house. "With attractive prices in all major markets, home buyers should make an informed decision to buy houses for self-use," says Maneesh Gupta, Senior Director, Valuation & Advisory Services at Colliers International India. "Our suggestion is to buy only ready-to-move property or where possession has been offered by the developer. This saves the cost of the double registry," says Anil K. Goyal, Partner, AKG Advisory.